As co-national trial counsel to Chrysler Group LLC, WTO successfully defended its client against automobile dealership Star Chrysler-Jeep in Glendale, California. Star had filed suit against Chrysler Group for alleged "oppressive and unreasonable" terms in a letter of intent to enter into a franchise agreement. Star's franchise agreement had been rejected along with 788 others in 2009 during the former Chrysler LLC's bankruptcy-proceeding. Star had won the right to receive Chrysler Group's customary and usual letter of intent through arbitration proceedings mandated by the U.S. Congress and signed into law by President Obama in December 2009. However, when faced with the usual and customary terms of Chrysler Group's letter of intent, Star claimed that several of the terms were unreasonable and violative of existing law. On Monday, April 9, 2012, Judge Gary Allen Feess of the U.S. District Court for the Central District of California agreed with the arguments advanced by Chrysler Group and made by WTO's attorneys and granted Chrysler Group's motion for summary judgment in its entirety. This order affirms Chrysler Group's position that it fully complied with statutory requirements that it provide former Chrysler LLC dealers who won the right to receive a customary and usual letter of intent following the nationwide arbitrations of 2010. Between January and July 2010, WTO, along with the Boston office of Wilmer Hale, responded to 418 arbitration demands made to Chrysler Group following the bankruptcy of the former Chrysler LLC, which rejected the dealer agreements of 789 dealers. The arbitrations were a dominant legal issue in 2010 for the manufacturer of Chrysler, Jeep, and Dodge vehicles, and were closely monitored by the entire U.S. automobile industry. 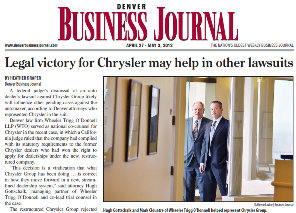 Read more about this case in the Denver Business Journal.